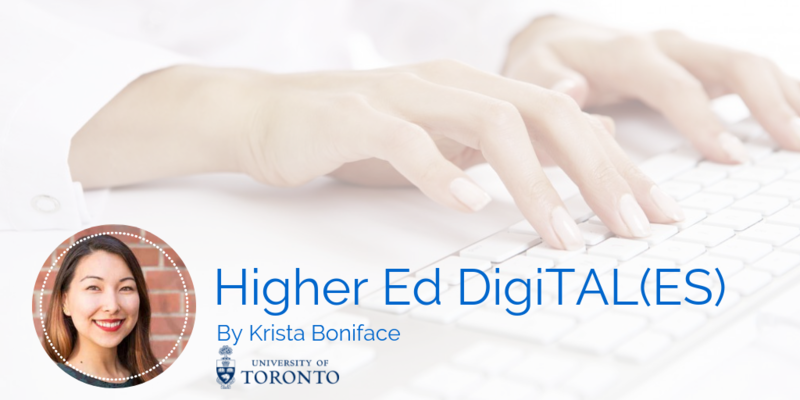 Higher Ed DigiTAL(ES) is a series on career advice and professional development for digital marketers and communicators working in higher education. As the Social Media Officer at the University of Toronto, I’m about to host the Higher Ed Social Media Conference organized by Higher Ed Experts as a cross-campus watching party for the U of T network of communicators for the 3rd time. After getting our 3 campuses registered for the conference, I offered Higher Ed Experts’ Karine Joly to share some great tips to make the Higher Ed Social Media Conference a truly enjoyable experience for the members of your campus community. Tips & tricks for a successful (small or big) team-friendly conference! 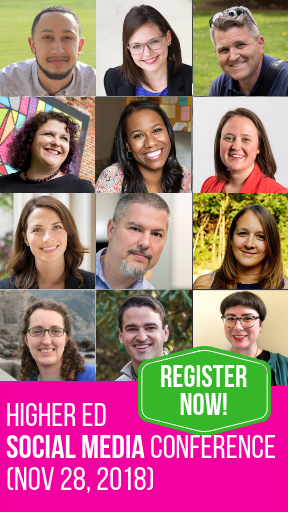 The Higher Ed Social Media Conference is not only a great professional development experience but one that you can make into a whole day for your campus communicators. As the fall semester sees spaces on campus fill up very quickly, don’t wait to book in a space for the number of guests you think will sign up as soon as possible. The key is to have enough space to sit your number comfortably, with a preference on having desks, so attendees can take notes. I always like to ensure there’s also a place for catering nearby, I’ll get to that next! I like to have tea, coffee and light refreshments available just outside the room for the morning sessions and then a catered lunch at noon, so that we can sneak out during the quick break to refuel. The ten minute sessions are lightning round style, so having catering close by helps attendees stay close and make the most of the day. To cover both the conference registration (now, USD 475 per connection) and catering, I have worked with our professional development centre to charge departmental budgets $25 per person. This makes it economical for your central unit as the organizer and ensures those that register come to the session they signed up for. Our university uses cost and fund centres for the charges and then we get reimbursed once registration closes. I will then send out an additional Google Form with some other questions to get to know attendees better and make sure I know what they’re hoping to get out of the day. I try to recruit 2-3 volunteers to be greeters and those who can add some signage to the route so people don’t get lost on their way to find the room. Greeters are also a great way for people to start to mingle and get to know each other. I always try to have the room open 30 minutes before the sessions start so people can settle in, talk to their peers and get a drink and a bite to eat before we get started. This is also the perfect time for a group selfie and to encourage your group to use the conference hashtag! Once sessions begin, you’ll notice there is a slide with hands up at the end of each session. You can take this time as the host to go to the front of the room and ask if they have any questions to add. Then, you can type the questions into the web conferencing screen to see if they’ll be answered. This is also a good time to cue the audience with questions on how this particular topic can inspire new ideas or ways of work on your specific campus. It’s a short discussion period but a good time to get people active and interacting amongst the group. Because the University of Toronto has three campuses, this year we’ll be hosting watching parties on all three: Downtown, Scarborough and Mississauga. At 2:30pm, we’ll log in to Skype to have a tri-campus call to do some reflecting and check in with the other campuses on what they felt was most helpful. This is a way to round out the day and connect all communicators together after an inspiring day! All in all, we find the feedback of hosting Higher Ed Experts’ online conferences for our campus has been overwhelmingly positive. It gives people the chance to come out of their offices, interact with new people, meet others we tweet to almost every day and gather new ideas and ways of doing what we do. It’s a cost-effective and fun way to bring our campus communicators together. Plus the catering (to make it a full experience that we can all look forward to) is an added bonus. Really looking forward to the Higher Ed Social Media Conference on November 28th!